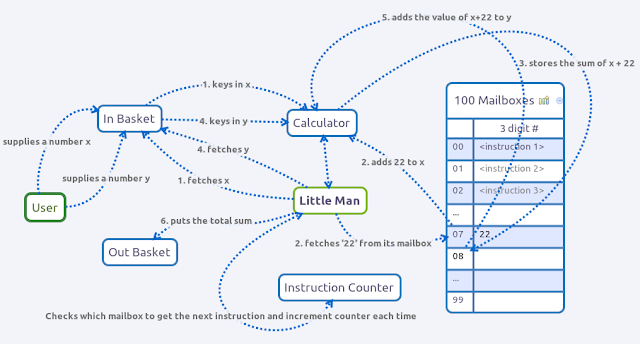 The Little Man Computer presents a simplification of the modern computer architecture. 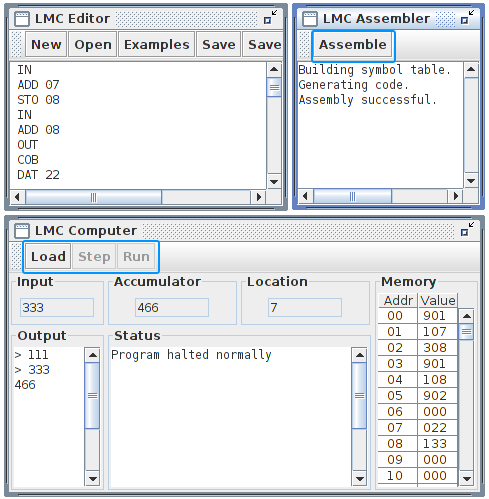 This post will go through the LMC model and from there we'll infer what goes on inside the common computer when a program is executed. We'll skip any formalities and deal with them later. Imagine if a little man, LM, is charged with the task of adding a given number x, no more than 3 digits, to an arbitrary number, say 22, then add their sum to another given number y. That is, performing x + 22 + y, where x and y are numbers we supply to LM. Let's imagine the setting that must be provided to LM for him to do his job. he'll need a box to get the most recent number given from his user - an "In Basket"
something to help him do the arithmetic - a "Calculator"
an indicator, which can be reset, to let LM know which mailbox to look for the next instruction or data - an "Instruction Counter"
a box that he could present the result to the user - an "Out Basket"
At this point, we know what instructions to give LM to do the job; here, we'll need to translate these steps into instructions that LM can understand. Now that we have an imagination of how the LMC works, let's give the instructions a run on a LMC Simulator Applet, courtesy of University of Minnesota Duluth. click the Load button in the LMC Computer window. Notice the machine code is displayed under the Memory field. Accumulator refers to LM's calculator. click Step to follow the execution of our instructions. Notice the arbitrary number 22 is stored in box 7 and the sum of 22 and the first input, in this case 133, is stored in box 8, which is coherent with our instructions given. From the LMC model, we can take away some key points to help us to understand the common computer architecture (Von Neumann architecture). Control Unit oversees the machine cycle: Fetch, Decode, and Execute. For instance, performing instruction 107 (mnemonic: ADD 07) stored in mailbox 01, upon reading the program counter for his next step to take, LM goes to mailbox 1 to retrieve the instruction 107, decoding 107 as 1 (the add operation) followed by the mailbox number 07, then execute the instruction (adding the data value stored in mailbox 7 to the value currently keyed in on the calculator). We've just tapped into the concepts of LMC and how it models the common computer we so heavily rely on everyday. In later posts, let's look at how to get LMC to do more interesting things using branching etc.